Ninjas have the supernatural power of jumping and gymnastics. It’s always fun to play games with these ninjas who keep on racing to get their mission. Dragon Ninja Rush is the most addictive game of ninjas from well known FunTag Games. Once you get this game on your device, it will be irresistible to turn it off. The simplicity of challenges to complete missions makes this game addictive. You can compare this game with the subway surf or temple run but it is surely more fun with more challenges that keep you intact. Starting with the normal run you will gain superpowers that will improve your ninja’s strength. With the improving abilities, you can collect the coins and gems in the route. You can enjoy ninja’s fun activities of scrambling, dashing, sliding and of course, running. You can choose among four characters that are Ninja boy, Ninja girl, Ninja Cyborg and the Ninja supreme. You need to collect coins and gems to jump on the Ninja Cyborg character and be an ultimate warrior. 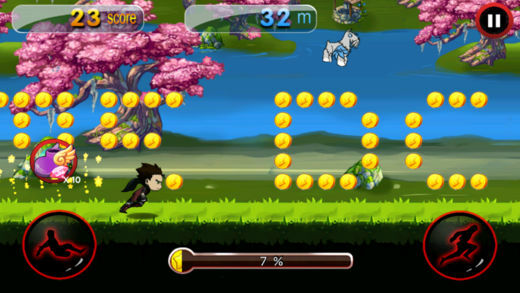 Dragon Ninja Rush game includes different interesting missions you need to accomplish. These missions are quick yet challenging that hooks you to the game. Diverse levels in the game will make you champion of the game. Various obstacles in the mission are the real fun to clear. You have to confront these obstacles and earn special rewards. You can see a list displaying your achievements in the Dragon Ninja Rush game. You have to develop your skills as ninja’s do with practice so that you can jump, slide and hop whenever needed. You have to be précised and accurate while using all the ninja’s skills. You may come across the traps made up of walls or bamboo shafts. Red bulls on the way will create a hurdle for you. If you mismatch the skills like crawling, sliding and jumping, you may get trapped to move further. This is the skill you have to gain as a gamer. Once you master this timing and predictions, you gonna go crazy for this game. Graphics are the first and foremost thing that makes the game interesting and engaging. 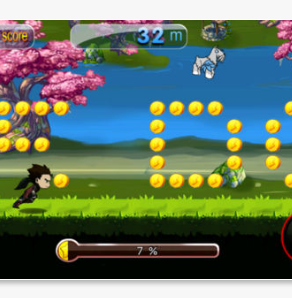 When it comes to such graphics of the Dragon Ninja Rush game, you get the 2D graphics with interesting animation. You can enjoy these 2D graphics even if you have an average Smartphone display working on Android platform. FunTag Games has used this 2D platform to incorporate game logics and different hurdles without much coding. This help you can enjoy the graphics light weighted for the Android Smartphone. All in all the Dragon Ninja Rush game is simple, light weighted and engaging. It is worth trying to get addicted with a Smartphone game.